Percival Hodgson, writer and violin theoretician, once locked Albert Sammons in a darkened room in the 1930s and took multiple photographs as he played his violin with an illuminated bow. The photographic results were called cyclographs and resembled multi dimensional chalk marks on a black background that traced the volatile motion of the bow in motion. They were used to support Hodgson�s belief in the essential curvature of bowing and were the culmination of years of widespread research into the physiological intricacies of bowing. I was reminded of Hodgson�s experimentation when looking at the tempo fluctuation graphs printed as an appendix in David Milsom�s formidably well-argued text. The graph measures beat numbers and duration and the effect is one of looking at a graph of the retail price index. These specifics, used as supporting evidence, are an indication of the techniques now available to analyse recordings. We are of course fortunate to possess recordings made by Joachim and Sarasate but can we rely on them as definitive musical statements and to what extent are they records, in both senses, of performance style and in what ways, if any, are they compromised by the technical frailties of the performers or by the inherent limitations of the recording medium. These are questions at the core of Milsom�s study as is the comparison or disjunction between nineteenth century musical treatises � books of instruction � and the early recordings that may reflect or refute them. His intention is to make contemporary players aware of the musico-aesthetic and philosophical complexities underlying performances of nineteenth century violin playing � to bridge the gulf that seems to separate us from them. Milsom�s modus operandi is to relate these treatises specifically to the surviving discs. 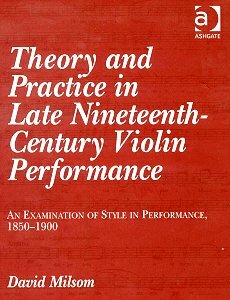 He analyses texts in relation to phrasing, portamento, vibrato, rhythm and tempo and then correlates them with examples of early performers on record, not by any means exclusively violinists. The texts are by Auer, Baillot, de Beriot and David and are familiar and standard ones. With regard to the recordings, as Milsom does admit, reliance cannot be absolute. The vagaries involved in their production (relating frequently to pitching) can distort their accuracy. We know that alternating current problems were endemic even as late as the 1940s in Britain. To an extent some of Milsom�s methodology is reminiscent of Robert Philip�s Early Recordings and musical style which analysed aspects of performance practice though not with as much specificity with regard to treatises and tracts or indeed to the bar by bar concentration Milsom furnishes. Though his focus is on the violin he does analyse vocal performances in much the same way, noting by analogue the frequently cited relation of the violin to the human voice ("Sing on the violin"). My own view is that this is a weakness and diffuses focus as does the similar analysis of spoken recordings no matter that the conclusions reached are broadly similar and in alignment with those drawn from violin recordings. And the conclusions? Firstly that there were indeed definable distinctions between the German and the Franco-Belgian school of violin playing. That the belief that the German school was the more intellectualised and the French-Belgian the more adventurous in vibrato usage, the former generally more fluctuating in tempo, the latter more uniform, is supported by the recordings. Clearly there are areas of subjectivity involved in a study of this kind but it�s noticeable how cogently presented are Milsom�s arguments though some of them are couched in a familiarly defensive academic manner. Above all, perhaps, one can conclude that performers of this period saw their music making as all embracing, that they drew upon a large reservoir of personal and intellectual experience but specifically that they tended to ascribe to themselves a more active role in performance than is now commonly the norm. They tended to exaggerate the expressive potential in the music but also to inhabit what Milsom defines as an "informal" approach to music making; more free and adaptational than is to be found in a culture that concentrates on texts and editions quite as much as fluidity of tempo relationships and the like. That said there are some limitations here. One would need to pursue his contention that Kreisler�s influence was "not as exceptional as one might imagine" in relation to vibrato. Citing Kreisler�s "difference" and "important influence" whilst proposing Hubay and Sarasate as containing elements of modern vibrato rather flies in the face not simply of the early recorded evidence of Kreisler�s own early 1904 G & Ts but of the testimony of two generations of fiddlers. Lionel Tertis admitted he�d remodelled his vibrato usage after hearing Kreisler and his experience was almost commonplace. The CD contains extracts of performances cited in the text as well as examples of Milsom�s own violin playing, applying some of the nineteenth century precepts to a performance of the first movement of Brahms� Sonata Op 100 and playing part of Fauré�s First Sonata. It seems unfortunate therefore, in light of the fact that the latter sonata was written for Paul Viardot that Milsom believes he made only one recording. He actually recorded fifteen sides and given Flesch�s sour verdict on him as a salon player it might have been useful for Milsom to have lent an ear, as well as to d�Ambrosio and some of the less well-known violinists. They were equally reflective of currents in performance practice as their more elevated colleagues. His listening research has been derived from CD transfers from such companies as Biddulph, Symposium and Pearl and the discography he appends is as a result flawed. He cites CD release numbers or, bizarrely, National Sound Archive reference numbers of items held by them. In a scholarly book of this kind all relevant original 78 issue numbers should be cited. In the circumstances the text references to Heifetz (b 1901) may be thought somewhat less than directly relevant and citing Stern�s 1962 Barber Concerto in a footnote seems a little pedantic. More worryingly whilst I wonder about the inclusion of vocal performances at all I find that citing and analysing the records of the "last Castrato" the Vatican based Moreschi is an act of chronological piety too far. He may well have been born in the right period but his was so anomalous a voice, so obviously a one off (at least in recorded history) that Milsom has to struggle far too hard to correlate his wavery records to the main body of his arguments. There are so many important violinists from that period missing that his inclusion seems unfortunate. Milsom has been relatively well served by Ashgate when it comes to graphs, tabulation and musical examples, of which there are a number. He has been rather less well served when it comes to the text. Rogue apostrophes and capitals abound, as do misplaced commas. If the English translation of Carl Flesch�s two volume �The Art of Violin Playing� really renders one of his sentences as "recourse to articulation which, furthermore, possibilitates the stressing of melodically or harmonically significant notes" then it�s time for a re-write. In essence I�m suggesting that Milsom could have locked his focus still further. If analogues to violin performance were to be sought then cellists were the obvious target; singers and actors may seem to generate a more panoramic sweep of widespread practices but in truth Milsom�s text becomes unnecessarily cumbersome when including them. The value of such a work lies in his balancing of text and performance; seldom judgmental when analysing the recordings he instead applies a scholar-performer�s eye and ear to matters of treatise and application of precept. His conclusions support the generalised historical view though in far greater practical detail than has ever before been accumulated. And Milsom�s own performances on the enclosed disc suggest an informed awareness of performance practice should not be dependent on gestural portamenti but should instead additionally embrace the complex issues of rhythm, vibrato and phrasing that his book so eloquently explores.